Jean-Auguste-Dominique Ingres. 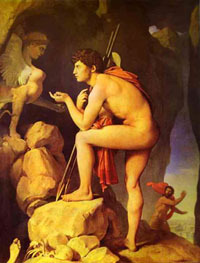 Oedipus and Sphinx. 1808. Oil on canvas. Louvre, Paris, France. 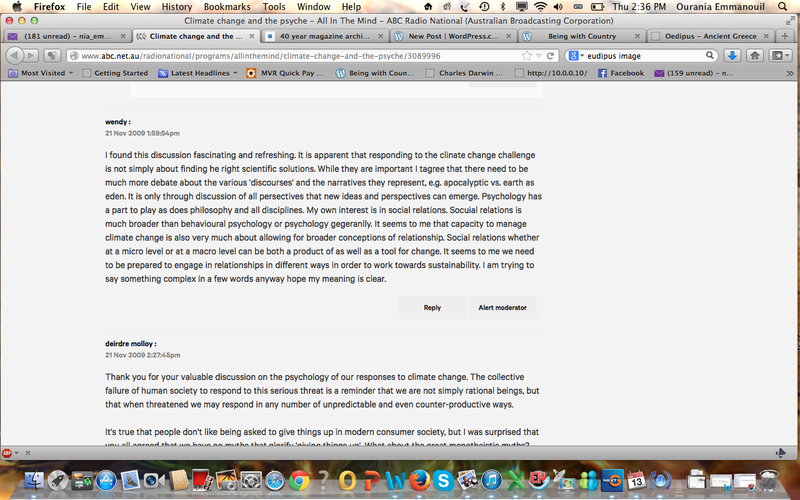 A friend sent me a link to a podcast titled Climate change and the psyche from ABC Radio National’s All in the Mind program. British climate scientist Mike Hulme and anthropologist Jonathan Marshall speak about the enduring myths and symbols that give us meaning and set templates for living. They talk about the way in which mythic frameworks underlie scientific viewpoints and are foundational to our beliefs about the world and in particular, the changing climate. One pertinent question which they pose is, how do we animate material realities? Rather than seeing the world around us and the changing climate as mechanistic, what are the stories we have created to make meaning of these changing realities? I took a screen grab of a comment that was made by ‘Wendy’ in response to listening to the interview [see below]. We need to engage in new ways of being… in my view this was the central thread that wove through the statements being made by Hulme and Marshall. Our society’s approach to a changing climate is inextricably tied to the way in which we conceptualize and perform our relationships with other species, the biosphere, lithosphere and atmosphere.